A visual workplace is a strategy that uses visual products and concepts to improve communication, and improve the way a facility operates. 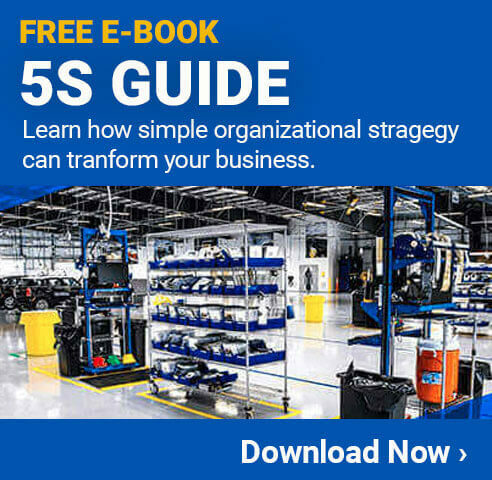 It is often used as a part of a larger continuous improvement program such as Lean, Six Sigma, or 5S. By creating a visual workplace, a company can ensure people have the information they need, when they need it, at all times. In addition, it allows for effective communication even when employees are working some distance apart, or when the environment is quite loud due to machines. There are many ways to define a visual workplace. In general, it is considered to be any workplace that has visual devices to help guide employees and others in the area so they know what to do, and when to do it. It also helps to promote a self-regulating environment that is more efficient, safer, and generally operates with less downtime and other issues. Improved Safety - Communication is essential when it comes to workplace safety, and visual communication can be an important element. More Effective Training - Studies have shown that people retain more knowledge when it is provided in a visual format. Using visual posters and reminders throughout the facility can also have a positive effect. Reduces Defects - Defects can occur due to a lack of communication between two or more people. Using effective visual cues can help avoid misunderstandings, resulting in fewer defects. Boosts Productivity - A visual workplace can help to significantly improve productivity. Benefits Organization - Using visual workplace products, it is faster and easier to keep things organized at all times. 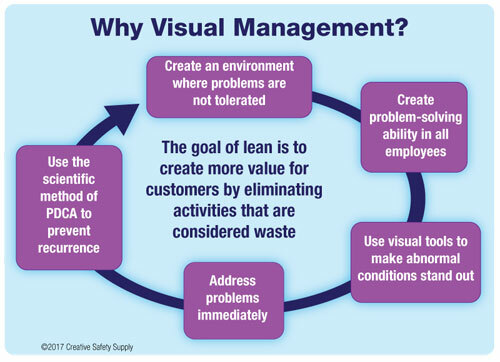 These are just some of the many reasons why companies implement visual management. When learning about visual workplaces, one of the most important things to do is learn what not to do. Many people mistakenly think that the best way to make a visual workplace is to add visual cues for absolutely everything that needs to be done. This strategy, however, ends up making everything look cluttered and rather than improving clarity, it only causes confusion. When there are so many things available to look at, people will tend to ignore them all rather than following the ones that are important to them. With this in mind, companies looking to use visual workplace strategies will want to find the right balance between making sure there is enough information out there, and ensuring all the information that is provided is clean and clear. When actually creating a visual workplace, it is important to have the right supplies available. Each facility is going to need a different set of supplies based on the specific needs that are present. There are many general categories of supplies that can be beneficial to almost every company. Learning more about the different types of supplies and how they can be used can be very helpful in understanding what a visual workplace is, and how it can be used. Floor markings are one of the most popular types of visual workplace supplies today. These markings can be used to give people directions on where they need to go, identify safety hazards, keep things organized, and much more. Floor Marking Tape - Industrial floor marking tape can be applied easily, and last for years without any trouble. It comes in many bold colors and patterns as well, making it an ideal option for just about any situation. Floor Marking Paint - Some facilities prefer painting the floor markings. This can be an effective option, though it is often more expensive and less durable than using tape. Floor Marking Shapes - Applying pre-cut floor marking shapes is a great way to improve visual communication. The shapes can be footprints, corner pieces, signs, letters, or just about anything else that is needed. 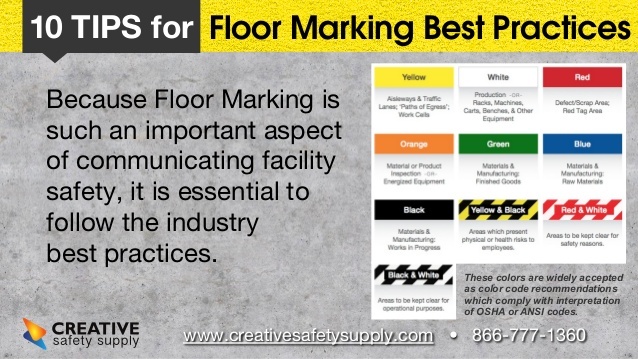 There are many floor marking best practices that should be followed whenever using any type of strategy in a facility. The following image goes over some key concepts such as the color and patterns that are used for certain things within workplaces around the world. Informative - Offering information to people in the area is another common way that signs are used in the workplace. Aisle marking signs, signs to let people know where an exit is, and many other types of information can be conveyed via signs. Instructions - Signs are an ideal option for giving instructions in the workplace. Many signs can go directly on machines or other equipment to ensure they are used properly to get the job done right. Directions - Helping people get where they need to go is an excellent use of visual workplace signs. These can be something simple like an arrow sign, or a sign that offers detailed information on how to get to a specific area. There are several popular ways to get the signs that are used for a visual workplace. First, they can be purchased pre-printed. There are many signs that are commonly used in a variety of workplaces, and they can be bought without any trouble. Another way is to custom order signs from a printshop or other supplier. This gives more flexibility on what the sign will say, but is often expensive, and can take a lot of time to get the signs that are needed. Many companies use an industrial label printer to create their own signs for the workplace. These types of printers are easy to use, have software to create custom signs and labels, and can ensure a company can have the exact sign they need, when it is needed. For companies that print signs and labels regularly, it is also less expensive then ordering these items from a third-party print shop. Shadow Boards - Shadow boards have a dark outline on the wall where each tool or other supply is supposed to go. They make it easy to see where each item belongs with just a glance. Foam Tool Organizers - Foam tool organizers fill a similar role as the shadow boards, but can be used in drawers, tool boxes, and other areas. Color Coded Work Boards - Color coded work boards help people to keep track of work tasks and job assignments. They are often updated daily, or for each shift, to provide instructions on what everyone should be doing. Markings for Storing Supplies - In storage areas and warehouses, there are often markings used to identify what should go where. Even on the shelves of a warehouse, many companies use labels to identify what goes in each section. These labels can write out what belongs where, or use QR codes to alert people. One important thing to note about many of the supplies listed here is that they don't offer information using written words. Many people make the mistake of thinking that a visual workplace needs to have lots of signs and labels that write things out. While those types of things are important in many cases, they aren't always used. Any type of visual cue that is used in the workplace can be very beneficial, even if there aren't any words at all. Visual communication can take advantage of the written word, pictograms, images, and even cutouts. The important thing is to make sure the right type of visual workplace supplies are used in the right areas to convey the right information at any given time. A visual workplace offers employees reminders and instructions on what should be done at any given time. Just because these strategies can help to guide work along doesn't mean that no training is needed. Teaching people what to look for, what images mean, and where to look for visual instructions is essential to ensure a visual workplace is as effective as possible.